One of Europe's most widely prescribed remedies because it's so effective for relief of insomnia, neuralgia and nervous tension. Each 225 mg. powdered extract tablet is equivalent to 1000 mg. of dried herb from the flower, stamen and leaf. Standardized to 0.3% hypericin and 3% hyperforin pharmaceutical activity. 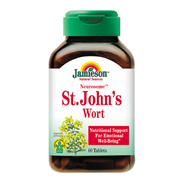 Each tablet contains: St. John's Wort 1,000mg.